Steam powered tram heritage ride in Rockhampton central Queensland. This is probably the only steam powered tram left in the world. It is a great little ride on Sundays only. Rockhampton (and Ipswich) were the first towns gazetted outside of Brisbane once self government for Queensland was obtained in 1859. When the Archer brothers, Charles and William arrived at the Fitzroy River where Rockhampton now stands in 1853, it was home to the Darumbal Aboriginal people. Their clan totem was the water lily, reflecting the abundance of this plant in the billabongs and lagoons that characterise this region of Central Queensland. The Archers saw the pastoral prospects of the region and the site’s potential as a major city port. They soon established their run called Gracemere, but rocks prevented them from sailing further upstream, hence the name of the town. Two bush pubs opened near Gracemere and in 1857 the town site was surveyed. It was gazetted as a government town in 1859. A small gold rush in 1858 saw 8,000 diggers travelling through Rockhampton. The river and Keppel Bay were alive with more than 70 ships. Rockhampton settled into a period of remarkable growth and prosperity. In 1861 the town had 700 people. By 1865 construction of the railway linking Rockhampton to the interior of Central Queensland had begun. The economic development of Rockhampton progressed in the 1870's with the first meatworks opening in 1871, followed by a soap works, a brewery, a couple of foundries, bakeries, and sawmills. A bridge across the Fitzroy River was in place in 1881 by which time Rockhampton was a major city with government offices, a Supreme Court, and impressive banking and commercial buildings. In 1882 gold was discovered at Mount Morgan, 45 km southwest of Rockhampton. This provided a stimulus for massive growth in Rockhampton. A building boom in Rockhampton followed this - the grand Customs House with its copper dome and spacious interior is an example (and now the Information Centre which we will visit this morning), but we will look at other magnificent Victorian buildings on our historical walk along the Rockhampton waterfront. The city also became the administrative headquarters for both the Anglican and the Catholic churches in Central Queensland. By the mid 1890's some prominent business leaders were calling for the establishment of a new colony of 'North Queensland', although a separate state movement had begun as early as 1861. Prosperity continued into the Federation Period and by 1901 the city had a population of 15,500. In 1909 the city's tramways opened, making it one of the few regional Australians cities with trams. The Second World War gave new growth to Rockhampton as thousands of military personnel were based here. This led to the establishment of the Shoalwater Bay Military Training Area nearby. Also the opening up of the brigalow scrub country to the west of Rockhampton made it the beef capital of Australia. Why is it the centre of the beef industry? Because there are over 4 million cattle in the region and the city has two major abattoirs processing works and it has the biggest turnover of beef cattle in Australia in its sale yards. The city processes half a million beef carcasses every year, worth over $200million in sales. Teys Meat Group currently employs around 900 people and is the city’s largest single employer. Coal mining in the hinterland from the 1960s onwards made Rockhampton an even bigger city. There are now 6 major coal mines in the Rockhampton area. This helped the population to grow to 50,000 people by 1975. The 16,000 hectares of irrigated cotton from the Emerald district also is shipped from Rockhampton. The region now has 100,000 people, including 18,000 students enrolled at the University of Central Queensland (many are external students learning by distance education). Archer Park Railway Museum (Corner of Denison, Cambridge and Archer Streets.). 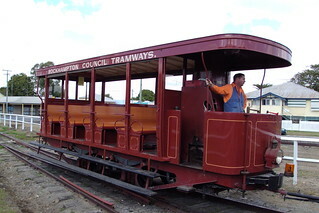 The museum of Rockhampton trams and railways is named after the city founders. It is located in the old historic railway station of Rockhampton which is a charming Victorian building. The station was designed by Henrik Hansen and is similar to the Emerald station which he also designed. It is a single storey chamferboard structure dating from 1899 with the roof behind a parapet. The veranda has cast iron columns and brackets. It has changed little since it was erected.